CABU is a short form for Caustic Soda and Bulk Carrier. 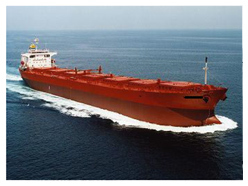 CABU is a specialized bulk carrier of panamax size, designed for handling caustic soda as liquid cargo, which is dangerous for conventional bulk carriers to carry. CABU vessels also carry dry bulk cargoes such as grain, coal, ore, bauxite, alumina etc.manifolds for caustic soda solution-three manifolds on the port side and two manifolds on the starboard side. This CABU course alongwith Framo course covers the mandatory minimum requirements for the training and qualifications of deck and engineer officers and any person with immediate responsibility for loading, discharging, care in transit, handling of cargo, tank cleaning or other cargo-related operations on CABU carriers. In addition the Deck officers will complete the Specialised Caustic Soda and Bulk Carrier Cargo Operations (SCABU) course to fulfil the training requirement for obtaining an Advanced Chemical Tanker Cargo Operations Dangerous Cargo Endorsement (DCE) restricted to CABU vessels. The above mentioned courses are approved by the Maritime and Port Authority (MPA) of Singapore and on successful completion of these above course + the requisite seatime (as per STCW Regulation V/1-1, para 6.2) shall entitle the candidate to apply to MPASingapore for a Chemical Tanker Level -2 restricted DCE.